Can design have a positive effect on children? On coG-studio’s Facebook page earlier this month, you may have noticed the Contemporist article we shared about The PlayRoom by WeNew Innovation. WeNew Innovation incorporates interactive learning into their architectural designs, illustrated below in the PlayRoom: “a functional space where children play while receiving wellness therapies.” This project got us thinking about the ways designers alter space to impact our well-being and behavior. Source: Contemporist.com, Design: WeNew Innovation, Photography: Flavia Faustino. Interaction Design: should design be fun? Interaction Design typically involves human-computer interaction and the study of human behavior. When designing a product or space, the focus is on satisfying a human need or desire—the human element is inherent in the project goals. 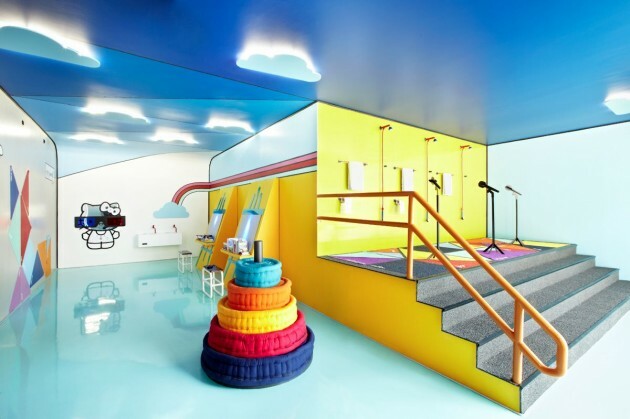 For example, the PlayRoom design aimed to heal through play, providing interactive pieces with integrated elements of color therapy, music therapy, aromatherapy and reflexology. This concept is present in The Fun Theory, an initiative of Volkswagen designed to change human behavior for the better by studying human behavior and providing fun alternatives. The Fun Theory’s “Piano Staircase” observed that people were more likely to use the escalator than to use the stairs (probably because it is the easier option), and asked the question: can a design intervention be introduced into this environment that will persuade escalator riders to use the stairs? With a little paint and the addition of an interactive computer system that made music with the touch of a foot, The Fun Theory noticed a remarkable change in behavior. By making the stairs fun and interactive, more people opted to use them instead of the escalator. In this small instance, they altered societal norms and human behavior. People not only chose to burn some calories, but some even danced and jumped along the way. Everyone left with a smile (and a story to tell!). It’s no secret that coG-studio has a strong passion for incorporating the needs children and youth in our design. Their dreams and desires are the heart of our builds and we strive to encourage the learning process and healthy growth. Consider the scrabble wall at the Victor Residence or the layout of the Glazer Elementary Academy as quick examples of ways we’ve incorporated interactive features in our design. We’ll continue to devise new methods for applying interaction design in our future concepts—because that’s what makes us smile.